One of the most basic ways you can start to get on the radar of another blogger is to regularly comment on their posts. Every blogger loves to have an active comments section on their posts, so if you can add value to their posts with your own feedback and insight they will take notice. Whenever there is a blogger that you would like to get to know, make an effort to comment every time he or she publishes a new blog post. This is an especially effective approach with blogs that don’t get loads of comments on every post, as it is easier to stand out. If the blogger is getting 100+ comments on their posts it will be a little more difficult to get their attention, but commenting is still a good starting point to your networking efforts. If you have been commenting on a blog for a while and that blogger comes across you somewhere else (whether it be social media, a link to your blog, comments at another blog, etc.) you’ll be more likely to stand out for them. And if you reach out to them directly by an email or a message through social media they will be more likely to feel like they know you. When you’re commenting on blog posts be sure that you are adding some value and not just leaving comments like “great post” that don’t really add anything to the conversation. If you’re looking for some guidance please see the Beginner’s Guide to Writing Awesome Blog Comments by Catherine Holt. Everybody loves getting links. Another way to get the attention of bloggers is to link to them in your blog posts, when it is relevant. Don’t force links just for the sake of linking to someone, but when there is an opportunity to include a relevant link that will add something to your post you should do it. WordPress will automatically send a pingback to posts/pages that are linked in your posts, so the other blogger may see the pingback and notice that you linked to their post. However, most popular blogs get a lot of pingbacks and there is a good chance that the blogger will not notice your link. It’s a good practice to email them to let them know that you have mentioned them and included a link to one of their posts. When you do this, be sure to include a link to your post in the email so they can check it out for themselves. If your post is long it’s also a good idea to let them know what section of the article includes the link so they can find it easily. When you link to others they may wind up sharing it through their social media profiles, and even if they don’t, it at least gives you the chance to get in touch with them and show that you appreciate their work. Most bloggers are very open to interview requests, and interviews can also make for excellent content for your blog. The busiest of bloggers may not have time to answer your questions, but you might be surprised by the interviews you are able to get simply by being proactive and asking. Interviews provide an excellent way to start to get some contact and to work on developing a relationship with that influential blogger. The blogger may even help you to promote their interview by sharing a link through their social profiles, or possibly even by mentioning it at their blog. Interviews by email are common for bloggers, but not the only option. You can also invite people to be on your podcast for an interview. This is even more effective for starting to develop a relationship since it will give you the opportunity to speak with the person you are interviewing, rather than just emailing. Podcasts are also really popular with listeners, and having a well-known guest on your podcast can be great for getting exposure to a new audience. Two excellent examples of bloggers that are using Podcasts to provide awesome content for visitors and also getting opportunities to connect with influential people are Ashley Faulkes of Mad Lemmings and Sue Anne Dunlevie of Successful Blogging. A very similar approach to interviews is the group interview or expert roundup. You’ve probably seen examples like 26 Expert Bloggers Share Their Favorite Blog Monetization Strategies and What Makes People Read Your Blog Post? 26 Bloggers Share What They Look For! There are a few specific benefits to these types of group interviews or expert roundups. Readers get insight from several different experts rather than just one person. Many of the experts included in your interview will share the post through their social profiles, which can lead to a lot of exposure. You get the opportunity to connect with a lot of influential people. It’s easier for the people being interviewed to answer one or two questions than to do an entire interview. 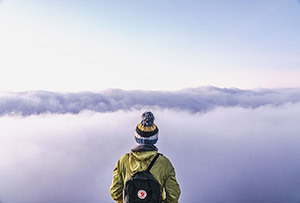 When I did my first expert roundup post I was able to get participation from popular bloggers like Yaro Starak, Jon Morrow, and Neil Patel even though I had no prior connection to them. I simply emailed them with two questions and they took the time to respond. If you haven’t tried this type of post before I would recommend it as an effective way to get in touch with some influential people. Sure, not everyone you email will respond or participate, but you may be surprised at who will take the time to answer your question, and you won’t know if you don’t ask. Another way to develop a relationship, partially through flattery, is to feature them in a top 10 list (I’m using the number 10 here, but it really could be any number). An example of this is my post 10 Bloggers I Respect and Admire, which was one of the first posts I published at ProfitBlitz. You can apply the same concept in any industry or niche. Some examples would be Top 20 Travel Bloggers to Follow, Top 10 Landscape Photographers, Top 10 Graphic Design Blogs, etc. Everyone loves to be featured or listed in a top list, and this is a great way to honor the bloggers that you are looking to get to know. Once you’ve published the post, email them a link or reach out through social media so they know about the post. More exposure is always a good thing for any blog. You can help others to get more exposure by sharing their posts through your social profiles. While you are commenting on the posts of the bloggers that you want to get to know, also take a moment to share the post, and be sure to tag the blogger so they see that you have shared it. Just like commenting, this approach is a little harder if the blogger is already getting hundreds or thousands of shares for their posts, but it is a good starting point. Kevin Duncan talks about this, and more (like commenting and general networking) in The Howdy Neighbor Technique. You should also be following the social profiles of the bloggers you are targeting, and make an effort to re-share their content to help with getting noticed. You don’t want to re-tweet every tweet they make, but when it is something that you think will benefit your followers be willing to share it. Triberr can be an excellent resource for connecting with other bloggers. It is most effective if you are blogging in a niche related to blogging, SEO, social media, internet marketing, or marketing in general. For other industries there may not be enough users in your industry to make it worthwhile. One of the best ways you can get involved is to create your own tribe and invite the bloggers that you want to connect with to join your tribe. Most active users are (the key word here is active, as some Triberr users have stopped using the site) are interested in joining new tribes. This means that you can get a lot of people to join your tribe even if you are not well known. Many people focus on getting involved and accepted to other tribes, but starting your own tribe can be quicker and just as effective. Dave Schneider shares some tips about creating a tribe in Hacking Triberr – How I Got a 6 Million Reach in Two Weeks with 80 Twitter Followers. If the blogger you are looking to connect with sells his or her own product, one great way to get noticed is to review the product. It could be an e-book, and online course, a membership site, or any other type of product. Of course, in order to be able to do an effective job with the review you will want to try the product for yourself before writing the review. You may need to purchase the product, or you could always email and ask if it is possible to get a free copy of the product for a blog review. Your blog review should be thorough and honest, and if the product is good quality this will provide some excellent exposure for the product seller. Ever if you don’t have a huge audience every product seller loves to see positive reviews because they may come up when someone searches for a review or information on their product, and they can also be an excellent source of endorsements or testimonials. Once your review is live, email the blogger with a link to the review and offer to provide them with a testimonial for their product. Of course, this assumes that you can genuinely recommend the product. Never provide a testimonial or recommend a product that you cannot confidently endorse. Another possibility when the blogger is selling a product is to promote it as an affiliate. This can be used in combination with the review of their product, but there are also other ways to promote it. You could send out an email to your list, mention it in other blog posts aside from the review, include a sidebar banner for their product, or even create your own bonus to give to anyone who buys the product through your affiliate link. Everyone who has an affiliate program will take notice of the affiliates who are effective at referring sales to them, so if you have the ability to drive some sales this is a great way to get the blogger’s attention. An under-used approach is to write and publish a response or follow up to a post from another blogger. In some ways this is fairly similar to the first suggestion about commenting on blog posts, except instead of commenting on their post you would be writing a more detailed response and publishing it at your own blog. This won’t be a good fit with every situation, but it can be a great option when you have a lot to add on a particular topic. Of course, you will want to mention at the start of your post that it is a follow up or response and link to the original post. And then email the blogger with a link to your response to their post. In some cases the blogger may even update their original post to include a link to your response. I used this approach when I was just getting started blogging and it landed me an easy link from the leading blog in my industry at the time. 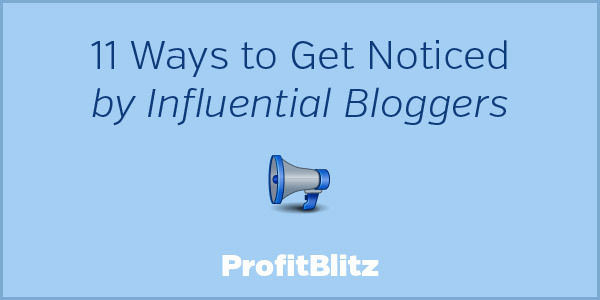 The suggestions listed in this post are for the purpose of helping you to get noticed by influential bloggers so you can start to develop a relationship with them. Don’t network with other bloggers simply to use them and their influence. Instead, look to build connections with influential people that might be mutually beneficial at some point in the future. Work to genuinely get to know others and always look for ways to help them. If you give more than you get you will be likely to win over a lot of people and ultimately it will wind up benefiting you in some way in the future.